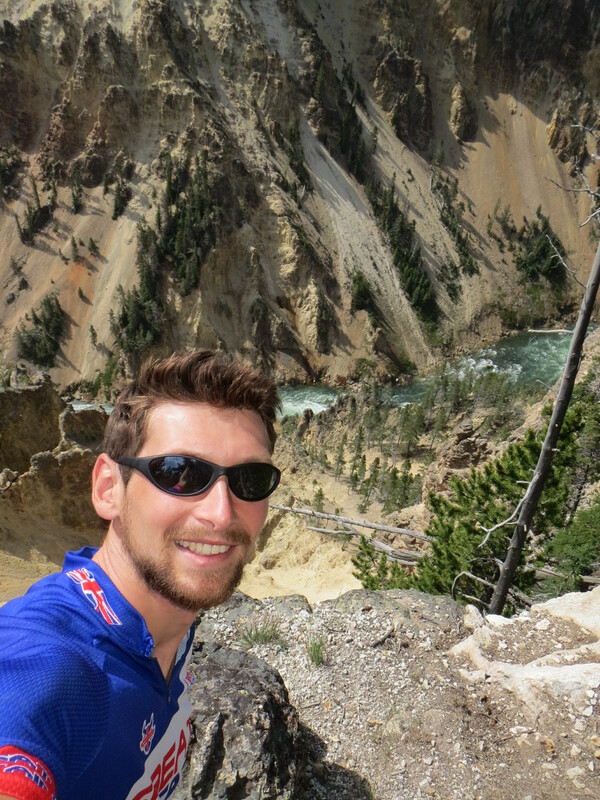 Yellowstone marked the first major milestone on my journey east, towards St. Louis. A mixture of natural beauty and oddity, the park deserved a little time for exploration. 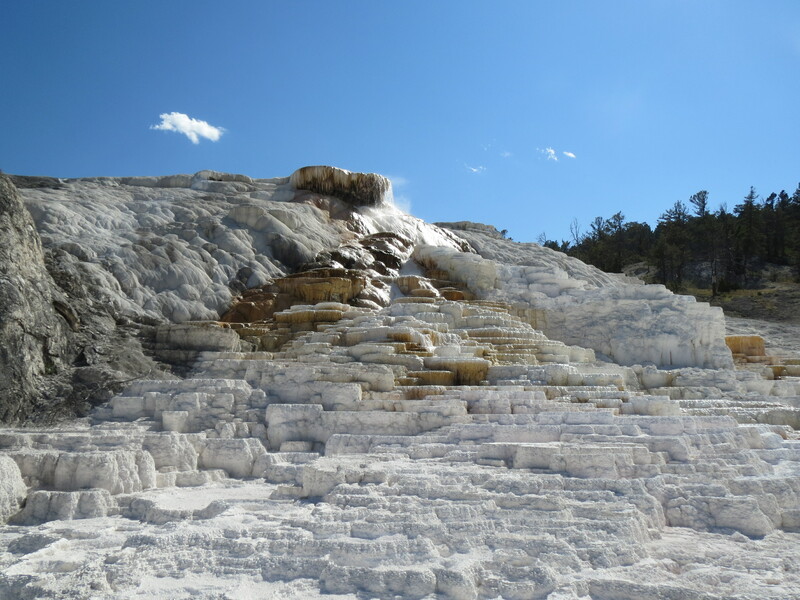 Therefore, Ben and I set off on an unladen tour of the northern part of Yellowstone, encompassing Canyon Village, Tower Junction and Mammoth Hot Springs. 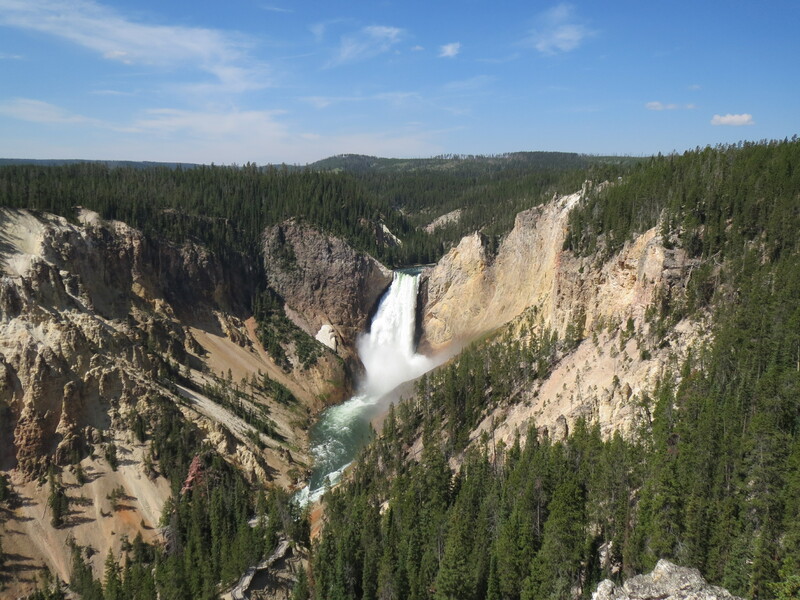 Traversing the highest pass in the park, we marvelled at thundering waterfalls, deep rocky canyons, steaming sulphur springs and the throngs of gawking tourists. 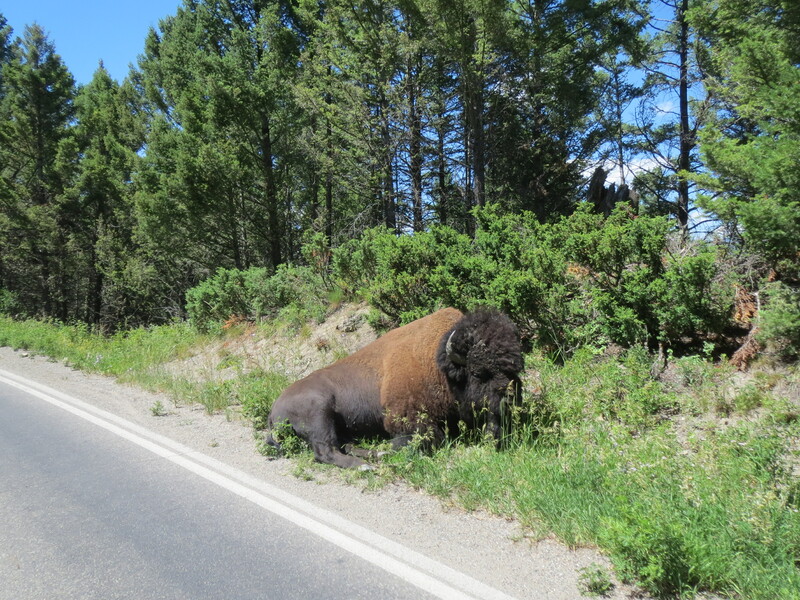 Despite the masses of human traffic, the park’s wildlife also dazzled. 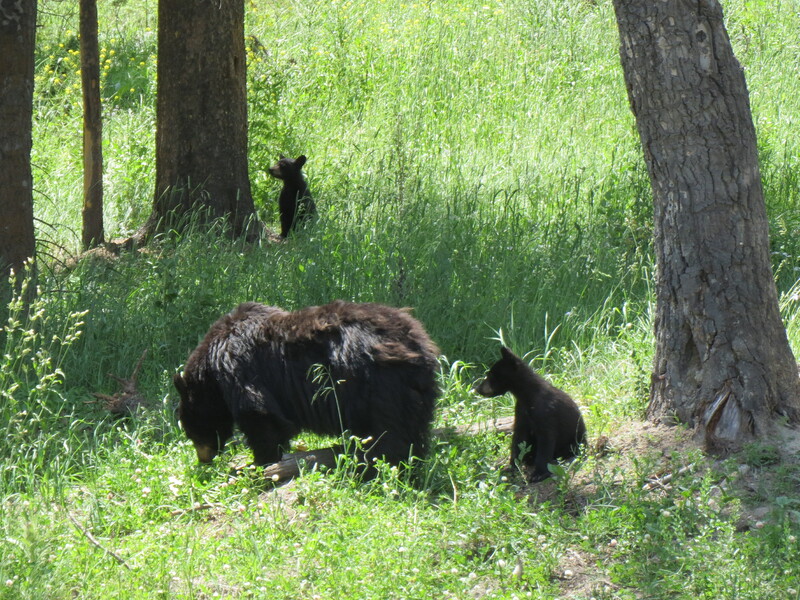 And, shortly after nearly walking straight into an imposing bison, we were lucky enough to spot a mother bear and her cubs foraging beside the road. However, this monumental sightseeing circuit came at a cost. Although not carrying our bags, we had climbed more than 1600 metres over 120 kilometres, fighting a fierce headwind in the later part of the day. 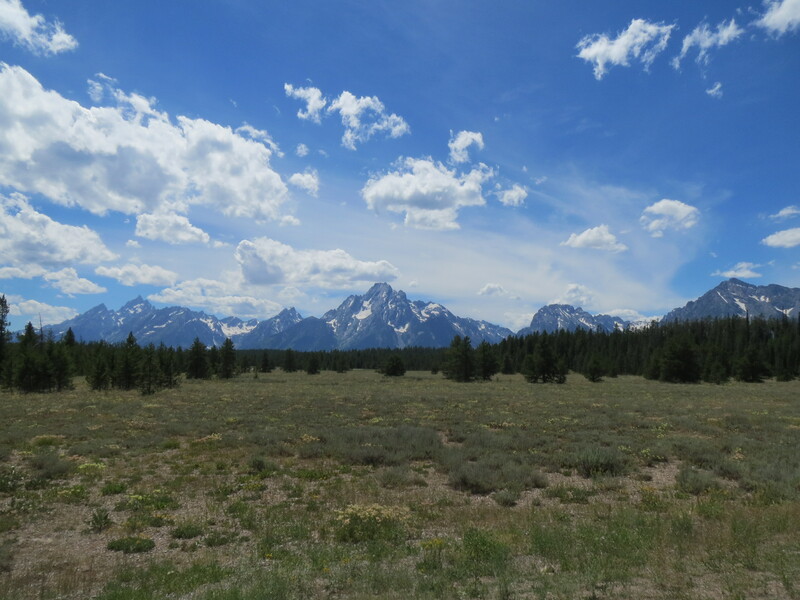 The next day, endeavouring to cycle off our aches, we headed south, towards the Grand Tetons National Park. Briefly stopping to experience the slightly underwhelming and suffocatingly busy Old Faithful geyser, we were soon thundering down a wooded canyon and out of Yellowstone. 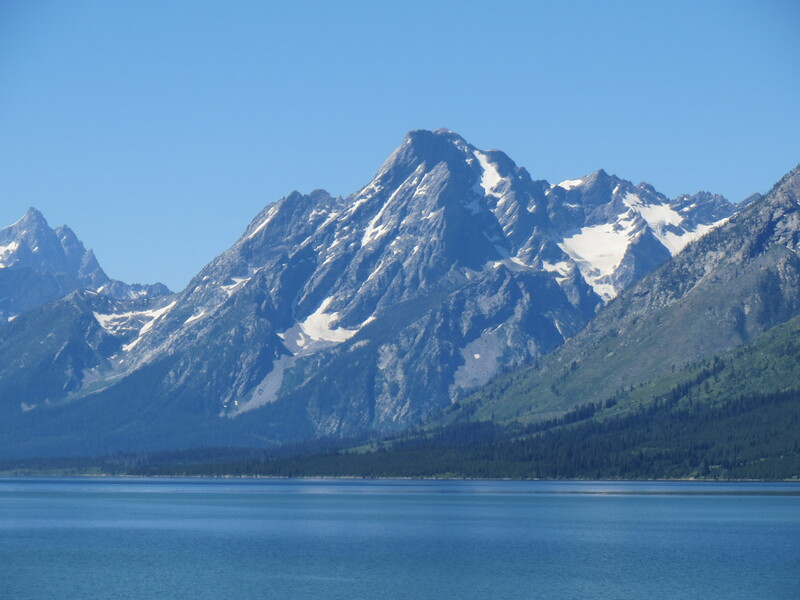 For an afternoon, views of the stunning Grand Tetons accompanied us as we rode through scenery that more than matched that of Yellowstone. Soon, however, we swung east, leaving the park behind, and began to climb. 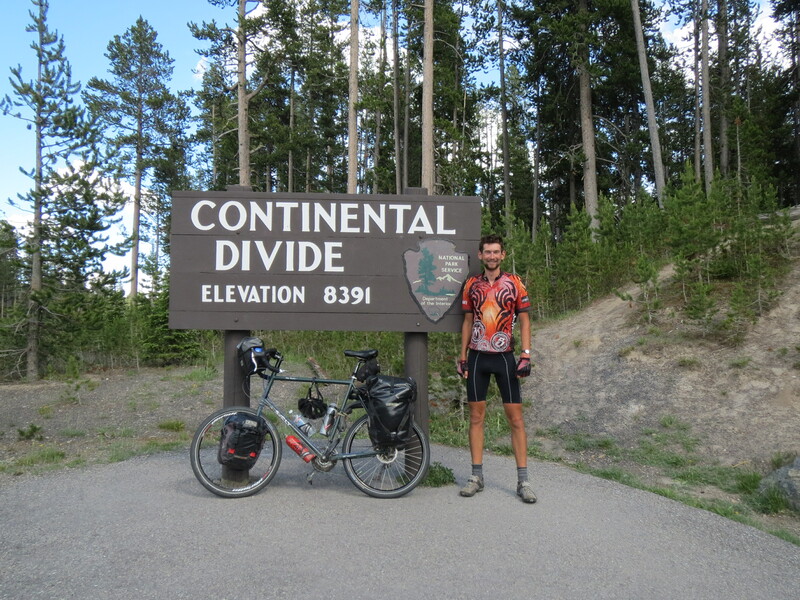 Three gruelling hours followed, until we finally summited and crossed the Continental Divide via the 2900-metre-high Togwotee Pass. 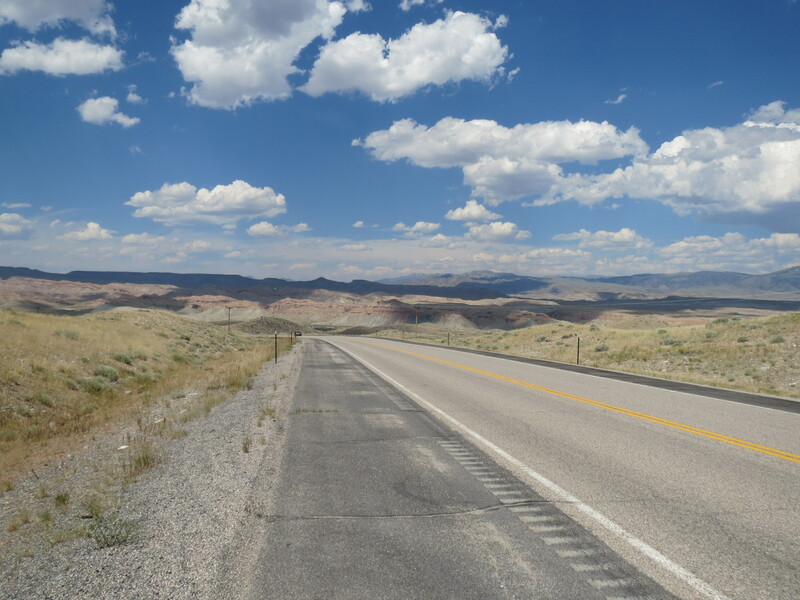 Since then, forests and mountains have faded into distant memory, as we have descended into the arid, rolling hills of Wyoming. With this new terrain have come new challenges; our first night out of the mountains was made memorable by the unexpected arrival of nighttime electrical storm. Camped under a picnic shelter – in a decidedly makeshift fashion – the howling winds and lightening that awoke us at 3am showed little mercy. Ben resorted to weighing down his tent with various possessions, whilst I resigned myself to having my tent pressed flat against me by the wind. 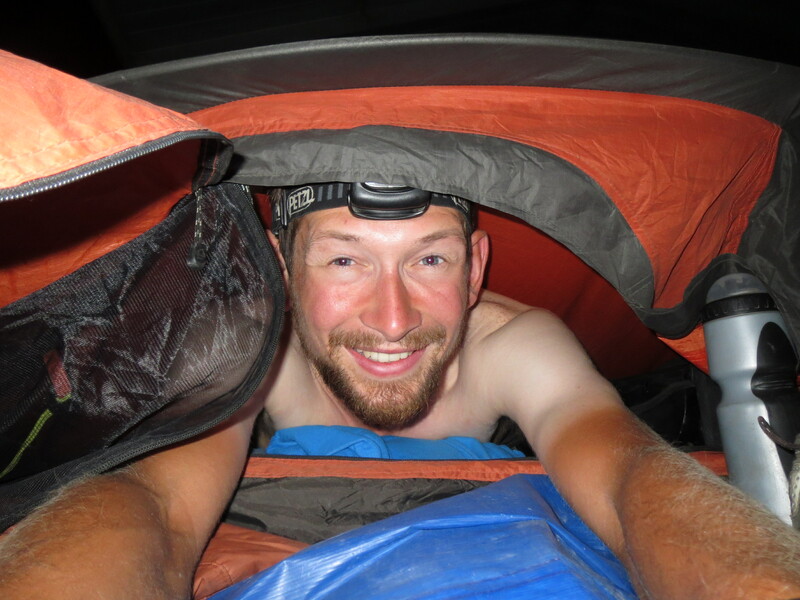 Fortunately, the storm soon passed and we were able to resurrect our lackadaisical camping arrangements. 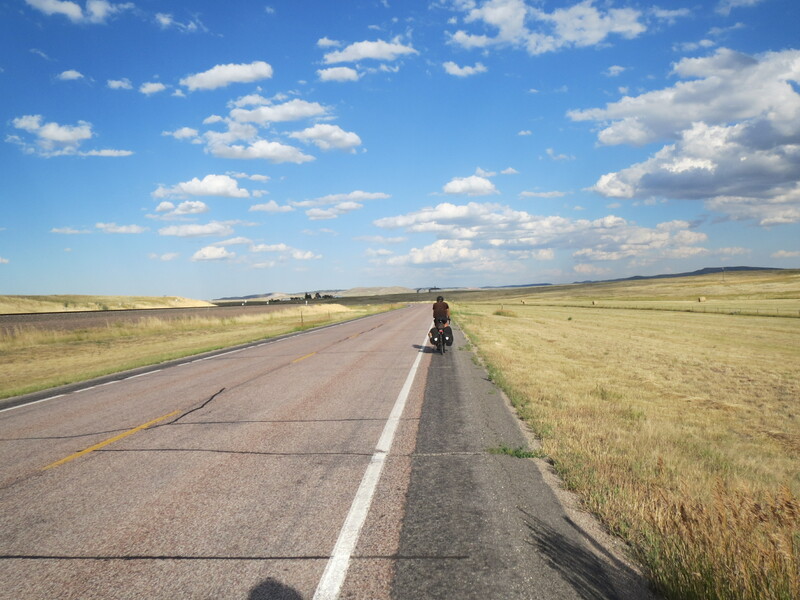 Our steady progress across the wide-open landscape of Wyoming has been aided or hindered by a frustrating mix of exhilarating tailwinds and tedious headwinds. 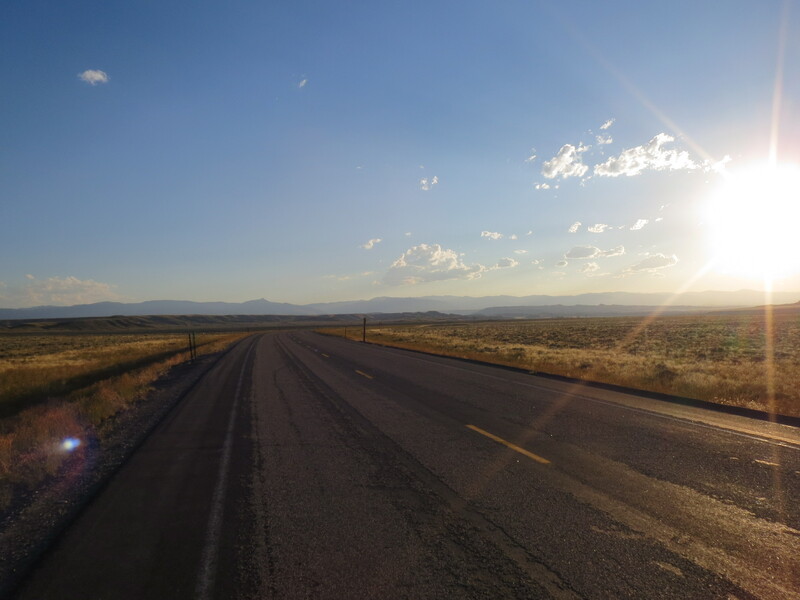 Despite this, the kilometres have flown by at an ever-increasing rate and the city of Casper, home to the only Warmshowers hosts in the area, appeared over the horizon after only a few days of riding. Here, we took advantage of Tom and Sheila’s amazing hospitality; soon we were gorging on Mexican lasagne, quaffing cold beers and chatting animatedly. The conversation and beer lasted late into the night, so it was some miracle when, around noon the next day, we finally dragged ourselves back onto the bikes. 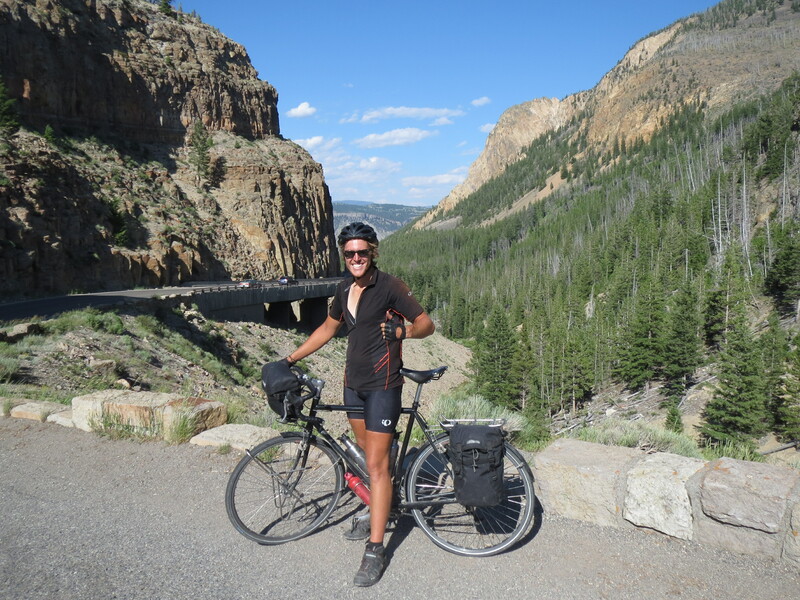 From Casper and its friendly hosts, we have surged eastwards, battling a nagging headwind. Now, we are headed north, into the picturesque Black Hills of South Dakota and towards the most American of all American landmarks, Mount Rushmore. Credit for the title goes to Ben. thoroughly enjoyed your overview of the journey with ben. Hope there are a few more hot or even cold showers on the horizon.Even though you have had a few hard days riding i get the impression that having a like minded travelling companion has made the adventure more interesting.